One part of your heating and cooling system that you may not pay as much attention to is the air ducts. These are the passages that deliver the heated or cooled air to your living spaces. If you haven’t looked at them in a while, or they haven’t been touched since you moved in, it may be time to consider a cleaning. If you or a family member has allergies or asthma (or smokes) and you don’t know if or when your HVAC duct system has had a cleaning, it may be time to schedule one. Dust, pollen and other allergens accumulate over time. Once it’s cleared, you’ll breathe easier. Seeing dust exit your system’s vents means you have a buildup inside the ducts, and should be cleaned out. Dust can inhibit your HVAC system from working optimally, making it work harder. If you’ve just moved into a house, new or existing, a duct cleaning will remove dirt and debris that may have been swept inside. Skip it if you know the previous owner has already had the ducts cleaned in the last three years. Clean your ducts after a recent home renovation, since dirt and debris can be swept into duct areas. If your house has had fire damage, or has a vermin/rodent infestation, call an HVAC company to inspect, repair and/or replace any damaged duct work inside your home. Air ducts only require an occasional cleaning. Experts recommend every three to five years. Anything more is excessive. Improper cleaning can damage the duct work. Should you suspect mold contamination, your HVAC company can inspect your ductwork and find the source of the moisture causing the mold. You’ll have to remedy the source of the mold before cleaning, repairing or replacing the duct work involved. If the mold is severe enough, you may need to replace all of the duct work to prevent mold contaminants from being spread throughout your house. Consistently changing your HVAC system’s air filter will keep your system cleaner, and reduce the dust inside the ducts. If you have shedding pets and vacuum regularly, using a higher-grade filter will catch most of it and keep the hair, dander and other allergens out of the ducts. You’ll also keep your system working properly and at peak efficiency. While it’s easy to get a “special” on air duct cleaning, it might not be the best option. You may save money on the cleaning, how do you know the company you hired is doing a thorough job? You’ll want to do a little research and make sure the company you bring into your home is professional. Ask questions, research, and make sure you can trust the company coming into your home. In business since 1943, W.G. 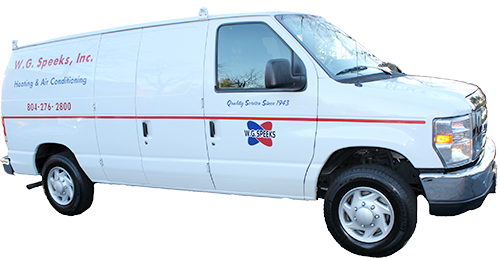 Speeks is the premier heating and cooling company in Richmond. In addition to HVAC repair and maintenance, we can inspect and clean your air ducts and make sure they’re delivering clean air into your home. We also specialize in improving indoor air quality by installing air cleaners, humidifiers and UV. Call us at 804-276-2800 to get a quote and schedule your appointment.